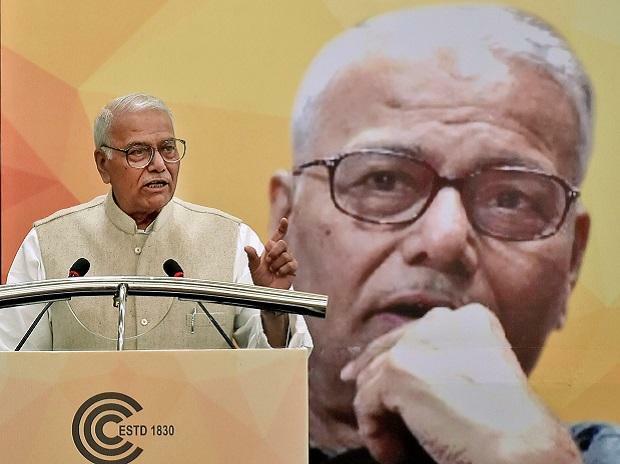 GDP numbers are misleading, RBI's autonomy is in extreme danger and demonetisation is the biggest banking scam, former finance minister Yashwant Sinha claims in his new book. He also says that Prime Minister Narendra Modi's idea of self-employment is a "distraction from the more serious issue of unemployment and underemployment". Sinha, who has been quite vocal about the government's policies since the past couple of years, quit the BJP in April. Party leaders have been dismissing his allegations on several issues with BJP chief Amit Shah once asking if people should believe the ministers or those "who did not get jobs". According to Sinha, Modi blew a golden opportunity to send the economy soaring to new heights. "He could have fixed the UPA's legacy issues and fundamentally raised India from a poor country to a middle-income country, but he squandered the chance," he says, adding his book demonstrates how "Modi unmade India". Though the book "India Unmade: How the Modi Government Broke the Economy" is a critique of the NDA government's economic management, Sinha says he has not always been a critic of Modi. "Nor do I have a personal vendetta against him for not appointing me minister or giving me some other post, as some people incorrectly speculate In fact, the truth is that I recognised his mettle early on and was one of the first senior Bharatiya Janata Party (BJP) leaders to say he should be made the party's prime ministerial candidate in the 2014 elections," he claims. He has been severely critical of Modi on demonetisation, jobs, GDP figures and Make in India among others policies and programmes. "The Modi government's lasting legacy will be the catastrophe that was the demonetisation of high-denomination currency on November 8, 2016," he argues. "Demonetisation was a whimsical decision that served no purpose of governance. It did, however, provide Modi with a populist campaign plank of having taken tough decisions to nab the corrupt rich. His decision paid a rich electoral dividend in Uttar Pradesh in 2017. But as far as the constantly shifting governance objectives of demonetisation went, it was a big zero," he says. On the second anniversary of demonetisation, Finance Minister Arun Jaitley had said that demonetisation resulted in increasing the tax base and a higher tax collection (both direct and indirect) for the government, thereby improving its fiscal health. He had also clarified that the real purpose of demonetisation was not the confiscation of cash but to bring it to the formal economy and make the holders pay tax. On Make in India, Sinha writes, "The malaise of Indian industry during Modi's tenure is typified by his most famous flagship scheme, Make in India. It is his biggest failure; it is also an unoriginal idea. It is nothing more than a revival of the National Manufacturing Competitiveness Council that the UPA set up in 2004, whose first chairman was V Krishnamurthy." He also says that the growth rates were seemed to have been recalibrated to make the government's economic management look good, with an average rate of 7.35 per cent over its first four years. The jobs Modi mentioned like 'pakoda' sellers, autorickshaw drivers, tea-stall boys and newspaper deliverers are all in the informal sector and are nobody's idea of an aspirational job, he says. He terms GDP figures as way below India's potential. "But then India is the only country in the world that grows at 7.35 per cent, without investment, without industrial growth, without agricultural growth. Just like magic," he writes in a sarcastic vein. The GST concept, he says, is good because it is simple and will lead to lower prices because there won't be any tax on tax; there'll be tax set-offs at every stage; and it will widen the tax net for transactions. "It is a better tax, but Modi-Jaitley botched it up at its very beginning. That GST has been tweaked 200 times already and over 400 notifications and 100 circulars and FAQs have been issued since its launch is standing testimony to the folly of the Modi-Jaitley team." Sinha says that UPA's management of the economy was also flawed. "When the global financial crisis hit us, the (UPA) government decided to focus on increasing consumption demand, and it began reducing or even eliminating some excise duties. "This, along with the debt waiver and MNREGA, was meant to put money in people's pockets to encourage consumption demand. Yet all these welfare measures hardly encouraged productive activity and did not increase investment," he writes. The Modi government, according to him, had everything going for it on all fronts; it had the kind of opportunity few governments have had in independent India's history, yet it squandered its mandate. "In summation, the Modi government is just about event management. He is the best in creating false impressions. In the process, Modi has given India its 'lost half-decade'. Elect him again and by 2024 it will be a lost decade," he warns. The book, published by Juggernaut, is co-authored by journalist Aditya Sinha. So, why is the need for the book?
" Over the last fifty-five months, the Modi government has dished out a stunning continuum of untruths and boasts about its economic management, performance and accomplishments. It thus becomes essential to speak truth to power, and so it is my job that this book be a statement of fact.